Why can't I change the breaker opening time in the arc flash spreadsheet? The breaker opening time is the time required for a breaker to open after receiving a signal from the trip unit to operate. The combination of the Trip/Delay time and the Breaker Opening time determines the total time required to clear the fault. For low voltage circuit breakers, the total clearing time displayed on the Manufacturer's drawing is assumed to include the breaker opening time. 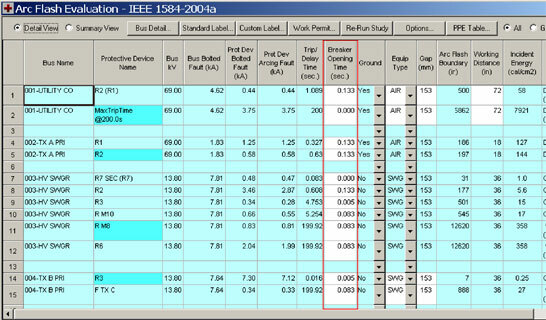 From the picture below (on page 2), you will notice that the column named 'Breaker Opening Time (sec.)' has a white background. This means that it is an editable field in the arc flash spreadsheet. 1.) The fault current contribution is coming from an induction motor set within the Options menu to clear in a specified number of cycles. a. The protective device that is suppose to trip that portion of the arcing fault current is set above the maximum arcing duration. b. You do not have a protective device to clear the arcing current.